Exclusive: Harrowing predictions of climate scientists are coming true, as glaciers melt, forests burn, heat waves proliferate and freakish weather strikes in unexpected places. But the propagandists of global-warming denial have succeeded in silencing most politicians and the mainstream press, writes Robert Parry. What has become most striking about the growing evidence that climate change is a clear and present danger indeed an emerging existential threat is the simultaneous failure of the U.S. news media to deal seriously with the issue, another sign of how the Right can intimidate the mainstream into going silent. We have seen this pattern before, as the Right sets the media agenda by bullying those who threaten its ideological interests. Before the Iraq War, anyone who dared raise questions about the Bush administration’s justifications could expect to be marginalized or worse. Just ask Phil Donahue, Scott Ritter and the Dixie Chicks. During Ronald Reagan’s presidency, his hard-nosed propagandists dubbed this tactic “controversializing,” that is, anyone who got too much in the way could expect to be subjected to systematic smears and professional deconstruction. With so many right-wing voices willing to say almost anything, it wasn’t hard to intimidate people. The smart career play was always to retreat when these forces were arrayed against you. Why risk your six- or seven-figure salary on some issue when there are so many other stories that you can work on without all the grief? And that’s exactly what we’ve seen. Though there are exceptions here and there, generally these heat-related weather anomalies have been handled like earthquakes, something that couldn’t be expected or stopped. There have been loads of human-interest stories about people coping or suffering but almost no larger context. This phenomenon of silence both in the political and journalistic realms has not gone completely unnoticed. It’s just that those who make the point are ignored, too. For instance, Sen. John Kerry, D-Massachusetts, gave a major speech on the Senate floor on June 19 lamenting the failure of the U.S. political system to address the global-warming crisis but the speech got little play. Kerry said, “As a matter of conscience and common sense, we should be compelled to fight today’s insidious conspiracy of silence on climate change, a silence that empowers misinformation and mythology to grow where science and truth should prevail. It is a conspiracy that has not just stalled, but demonized any constructive effort to put America in a position to lead the world on this issue. “In the United States, a calculated campaign of disinformation has steadily beaten back the consensus momentum for action on climate change and replaced it with timidity by proponents in the face of millions of dollars of phony, contrived ‘talking points,’ illogical and wholly unscientific propositions and a general scorn for the truth wrapped in false threats about job loss and taxes. “Yet today, the naysayers escape all accountability to the truth. The media hardly murmurs when a candidate for President of the United States in 2012 [a reference to Mitt Romney] can walk away from previously held positions to announce that the evidence is not yet there about the impact of greenhouse gases on climate. “The truth is, scientists have known since the 1800s that carbon dioxide and other greenhouse gases trap heat in our atmosphere. With the right amount of these gases, the Earth is a hospitable place for us to live. But if you add too much, which is what we’re doing right now, at a record pace, temperatures inevitably rise to record-setting levels. It’s not rocket science. Kerry continued, “The level of dissembling, of outright falsifying of information, of greedy appeal to fear tactics that has stalled meaningful action now for 20 years, is hard to wrap one’s mind around. It is so far removed from legitimate analysis that it confounds for its devilishly simple appeal to the lowest common denominator of disinformation. “In the face of a massive and growing body of scientific evidence that says catastrophic climate change is knocking at our door, the naysayers just happily tell us climate change doesn’t exist. In the face of melting glaciers and ice caps in the Arctic, Greenland and Antarctica, they say we need to ‘warm up to the truth.’ And in the face of animals disappearing at alarming rates, they would have us adopt an ‘ostrich’ policy and simply bury our heads in the sand. “Al Gore spoke of the ‘assault on reason.’ Well, Exhibit A is staring us in the face: Coalitions of politicians and special interests that peddle science fiction over science fact. A paid-for, multi-million dollar effort that twists and turns the evidence until it’s gnarled beyond recognition. “And tidal waves of cash that back a status quo of recklessness and inaction over responsibility and change. In short, it’s a story of disgraceful denial, back-pedaling and delay that has brought us perilously close to a climate change catastrophe. “What’s worse, we’ve stood by and let it all happen, we’ve treated falsehood with complacence and allowed a conspiracy of silence on climate change to infiltrate our politics. “The conspiracy of silence that now characterizes Washington’s handling of the climate issue is dangerous. Climate change is one of two or three of the most serious threats our country now faces, if not the most serious, and the silence that has enveloped a once robust debate is staggering for its irresponsibility. So what was the reaction to Kerry’s address? It got some notice on blogs, especially those dedicated to climate-change issues, but received almost no attention from the mainstream news media. Ten days after Kerry’s speech, the Washington area was struck by a “derecho,” a weather event virtually unknown to the people of the region. 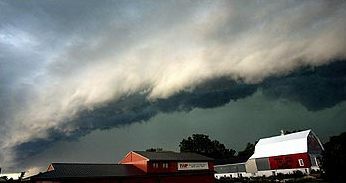 This straight line of fierce thunderstorms uprooted trees and knocked down power lines leaving much of the sweltering capital area in the dark and without air conditioning. The devastation along with forest fires in Colorado and 100-degree heat over much of the country got lots of attention from the news media. But there was almost no discussion of the why. Granted, no specific weather event can be traced directly to global warming, but climate scientists have been saying for years that the gradual increase in temperatures will be accompanied by more and more extreme weather patterns, exactly what the United States and much of the world are experiencing. Yet, just as the U.S. news media failed the country in 2003 by caving to the Right’s pressure on the Iraq invasion, American journalism is now failing future generations by cowering in front of the loud voices of powerful climate-change deniers. I am ashamed to think that with my education, I am still brain washed by the news. thank you for the article on global warming. Unless the sun gets hotter or closer to Earth global warming is impossible.No political rhetoric can change the laws of physics. But the Earth is getting farther from the sun. It was recently measured! 14 cm a year isn’t much but it adds up over a thousand years. Humans need to build more greenhouses if they want food in the future. Not to mention we are a volcanic eruption away from an ice age. The greehouse gas/warming link is a fraud and those trying to profit from this fraud belong in a maximum security prison! The argument about the cause global warming is a red herring. The fact it is happening is what matters, and disputes about the cause just go round in circles. What will be done about it: nothing! There is nothing anyone is willing to do; it is to late. It has always been to late. Will people stop driving their cars: no they will not. Will the petrochemical industry stop looting the third world of its mineral resources: highly unlikely. Will there be and end to rapacious wars and humanitarian bombing aid? What do you think. And how do we know the elite are not making plans to save themselves? They are not exactly paragons of civic virtue, look at their notion of humanitarian aid. These people have access to more information than we do. They are also in a position to talk it down, and they are. What, after all, is the point of creating panic. Whose interest would it serve to start a scramble for the life boats when there arenâ€™t enough for everyone. If global warming is a fact, tens of millions will perish, and it will not take long either. How long could a city the size of London or New York survive without transport, food, medicine and fresh water. Cities are complex structures where nothing grows except the crime rate. Face facts, we are wasting our breath trying to convince government about the need for action; if they do not know it by now they never will. I believe they know very well what is in store. Do not believe anything is true until it has been officially deigned. Good luck everyone; we are going to need it because there is no â€œweâ€ racing to our rescue. The science is not settled. The so called global warming scientists who fudged and hid date contradicting their predictions, prove by deed they are not scientists. The latest good data going back 2000+ years shows we are cooler than we were 2000 years ago. The data set shows a lot of variability. The odds given we have been in an ice age for 90% of the last two million years and inter-glacials last about 10,500(ours is long in the tooth)is ice. Anyone who wants cold does not think well, that would kill most of us, not sea level rise from warming which would massively increase the bio productivity in the marshes created, plus open up huge new croplands in North America and Russia. In short, cool your jets, we don’t know and if this idiotic refusal by warmists to look at the new better data continues, they will deservedly be ignored as are Michael Mann and the others from the IPCC for lying. The real pity is that these people (the climate change/global warming/environmental degradation deniers) are running the big corporations, which have bought our governments. They have no conscience. They are willing to say or do anything that will keep getting them what they want, so long as someone else has to pay the price. If we do not make them accountable and take charge of our own destinies, then by default we choose to run off the cliff with them. It’s time we all faced up to the fact that there is no political ‘saviour’ who is going to emerge and save us from our own hubris. Either each of us takes up the challenge or no one will. OK. I agree with everything Kerry says in this speech, obviously. But why doesn’t he condemn Obama for not using the bully pulpit to make this his first priority. If a sitting US Senator criticized a US president, surely that would make the news. But his is a conspiracy just as bad as the conspiracy of silence he condmens, a conspiracy of putting party interests before the public interest. What can common people do to increase media attention? That’s what we should focus on. A debate very much like this one must have played out on Easter Island as they discussed what to do about the dwindling supply of trees. As long as we live in a democracy, a handful of climate scientists can throw a bunch of statistic out there, and politicians like John Kerry can make speeches to an empty Senate chamber, but the public will not pay attention until their own water sources dry up completely, vast forest fires consume their neighborhoods, floods and hurricanes sweep away their favorite beach resorts, and crops fail so repeatedly we actually see empty shelves in the supermarket. Even then, there will be those who say these are just local phenomena and even if they aren’t, we can’t do anything about it. In other words prophets of doom are never listened to until it’s too late. Just go back and read the book of Jeremiah in the Bible. The call to live an upright life, to care for the poor and needy, govern the people wisely, and build defenses against future calamities seems always to go unheeded. Repentance!? Way too much to ask. You can see just from the replies already left here that at least 3 remain unconvinced about climate change, and the readers of this blog probably are mostly pretty liberal. Who is he going to judge? Everyone including the dead. Who is he going to DESTROY? Those who destroy the Earth. Who are they? Obviously – Polluters and those who support them. Hmmm… I see Europe had an unusually cold winter and now a cold summer. Is that just weather, while what’s going on in North America is global warming? Oh, so you “hear” Europe had an unusually cold winter? Were cold records broken like they were in http://www.ncdc.noaa.gov‘s map for July in the US? (Not sure this forum supports links, but it was posted in a lot of major net newspapers, you can google it). I’ll save you the research: They weren’t. Europe didn’t have an especially cold winter, it had an especially snowy winter, which is a different matter entirely. (All it takes for snow is less than 0 degrees C, and lots of air moisture – guess what global warming does to air moisture levels?). I don’t think the fact of global warming is seriously in dispute. Instead, apart from the statistical analysis showing various correlations, one of the biggest areas of contention has been the failure to identify the extent to which manmade causes have been responsible for the global warming we are experiencing, or the extent to which we will be able to reverse, stop, or slow down global warming, by reducing harmful emissions. Also, with global warming intertwined with global pollution, the analysis is that much more complex. One doesn’t have to be an atheist about the global religion, or even a full grown agnostic- one can still profess ignorance as to how much good it will do in the end, even if one acknowledges that we can and must try to reduce unnecessary emissions. I raise that question because the world has over centuries experienced long term warming and cooling cycles that have predated the level of industrialization we have today. Moreover, whenever the earth’s innards are erupting through volcanoes, the level of heat and energy can eclipse other sources. In addition, the cycle of polar icecaps warming and its effect on cooling other areas of the sea has not been clearly defined. Let’s assume we can do a lot, or at least something about it, in the end we may also have to be prepared for changes that we cannot influence that will affect future generations, and have to plan for that as well. Though your correct about the world experiencing long term warming and cooling it would be an understatement to say that the harmful emissions man pumps into the environment is like putting that process on steroids. And as to how much good attempts to improve the environment could do; In my opinion, better trumps worse every time. Silencing what’s going on denies people the opportunity to decide for themselves what measures they should take as individuals and citizens. We can thank Frank Luntz and his focus groups for finding a more innocuous term for what is happening, and don’t forget Fox News and the other corporate media, and the Regressive Party faithful. Once again the sun is left out of the argument….You know, the big bright shinny ball in the sky that heats the planet? Say it isnt so…. How about other planets experiencing these changes? Is that again left out too…… No man made global warming has to be the answer… If its the answer… Why instead of changing it are they just going to make you pay a fee for it…. I am all about saving the planet we are destroying it… But your governments greedy hands only wants the money from it.. Take the profit out of global warming and watch how many views in the media change. Right, it’s left out of the argument because the science has already determined that it doesn’t play a role in what we’re experiencing now. The science is settled, and all that’s left is for paid shills like you to keep repeating tired, debunked non-facts. What’s next? Cigarettes really are good for your health? As a progressive, I get sick of these articles that have no science whatsoever. It is the same old pablum. Jimbo is right — there are a whole group of astrophycisists who think that the global warming of this century was caused by a huge increase in the magnetism of the sun. Learn about the Maunder Minimum, and read about Henrik Svenmark’s (Danish) theory. Check out he astro physicists Habibullio Abdussamatov (Russian), Jasper Kirkby (British) and Nir Shaviv and their ideas as to why we may be headed towards another mini ice age because Solar Cycle 24 is producing much lower levels of solar magnetism. These physicists believe that cosmic radiation causes clouds to form and the more cosmic radiation the greater the clouds and the cooler the earth. The solar magnetic field protects us from cosmic radiation. A highly magnetic sun protects us from cosmic radiation causing fewer clouds. The sun has gone into a magnetic funk after having been highly magnetic during the last century. The last time the sun went into a magnetic funk in the 1600’s we had the little ice age. Jimbo must work for the JPL! What else would account for his rapier like logic and solar system knowledge? Hey Jimbo, I got one word for you, “Venus.” Closest planet Earth has to a sister, just a little closer to the sun, but with massive amounts of C02 in it’s atmosphere and it is 900 F in the shade. It has been like that for ages. Is this the best we can do? We are completing ignoring the environmental events that are gong on around us due to manmade emissions. Erratic weather will soon be the mainstay, and thousands of people will be displaced. If there is No Environment, there will be No Economy. The technology is here, we can make the changes and start taking responsibility for sustainable development. Why are we so afraid to put to rest our antiquated source of energy that is old in concept, highly polluting, and inequitable for the masses. Is this the way we want it to happen? Not even give our kids of today a fighting chance, and the opportunity to have an abundant life full of promise? Sir,two of the most harmful(alleged) sources of greenhouse gases are the airline industry and our war machine. Ending both is not in the cards played by the monsters.